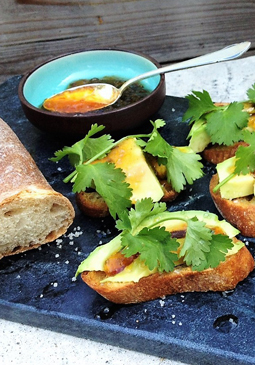 Crostini with Avocado and Hell Fire Pepper Jelly - A recipe from Savor California, the online showcase for extraordinary gourmet foods and beverages from California. Slice baguette thinly, biscotti-style. Rub cut cloves of fresh garlic on each slice. Brush with olive oil. Arrange prepared bread slices on a cookie/baking sheet and toast in the oven (middle to upper rack) for about 10 minutes, or until just lightly browned. Remove from oven and place on a platter for assembling. Place a thick slab of avocado on each bread slice. Spoon Hell Fire Pepper Jelly (gingerly) over the avocado. Drizzle with more olive oil. Shake sea salt over layered crostini and top with a sprig or two of fresh cilantro. Offer a jar of Hell Fire Pepper Jelly and a spoon for guests who want to add more heat! Optional addition: Add shaved or crumbled bits of cheese, such as Manchebo or pecorino.